The TSO ISRDDN command is a useful tool that lets you browse/view your active TSO session libraries. From any session, type TSO ISRDDN and the below widow will open up. On the right side of the display is a list of DDNAME(in white colour) and their associated data sets ( (in Green colour) currently allocated to the user session. The left side of the display contains columns of information about individual data sets like the volume information and all. When you scroll right (using F11)or left(or F10) , the left side of the screen changes. Initially, the left side of the screen contains the volume name and disposition,if the dataset is SMS managed or not ,etc . If the disposition is red, there are other jobs waiting to use this data set as shown. Generally the dataset associated with sysproc ddname contains the pds for the clist macros available in the system. 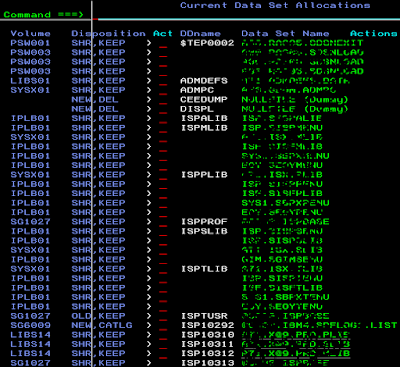 Try issuing the command LINKLIST or LPA. 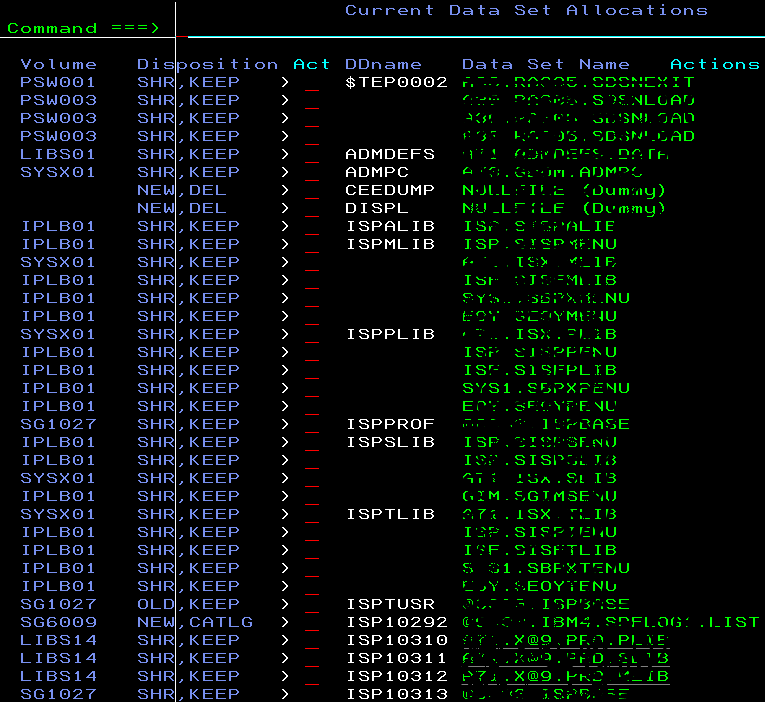 Either command will add both the system LINKLIST and LPA libraries to the display.The LINKLIST and LPALIB (Link Pack Area LIBrary) are related concepts. The LINKLIST is a collection of libraries, established during the IPL, that contain system and user load modules. Any program in the LINKLIST does NOT require a JOBLIB or STEPLIB to point to the load library -- the system can find such programs without any JCL statements. The LPALIB basically contains read-only programs (which may system or user load modules) that are reenterable.